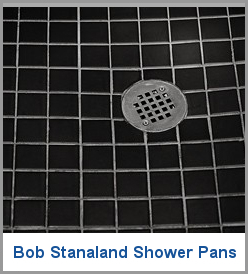 Bob Stanaland Shower Pans, Co. started in 1965 by Robert E. Stanaland and incorporated to Bob Stanaland Shower Pans, Inc. in 1985. Today the company is owned and operated by his son, Robert D. Stanaland. Bob Stanaland Shower Pans, Inc. guarantees its shower pans for 10 years against any water leakage; provided that a water test on the membrane is conducted after installation to validate the guarantee. • Shower Pan Hot Mop & Lots More! Serving Sacramento, CA & Surrounding Areas. Bob Stanaland Shower Pans, Inc.